US Ambassador Sung Kim handing out congressional gold medals to World War Two veterans in Baguio today. Seventy-six years after the liberation of the Philippines, the US Ambassador has honoured 29 Filipino war veterans with congressional gold medals. 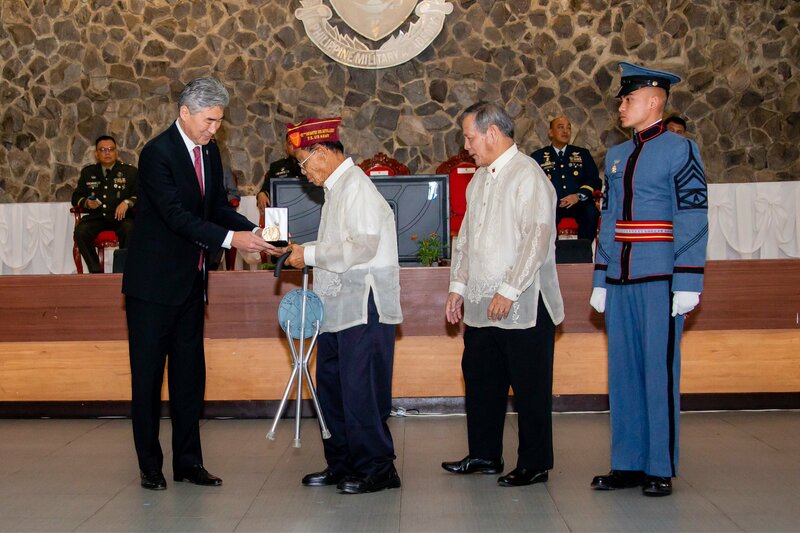 Speaking at a ceremony at the Philippine Military Academy today (Saturday, October 27), Ambassador Sung Kim said: “The congressional gold medal is given to the Filipino war veterans in recognition of their dedicated service, and selfless sacrifice during the war. The medal presentations were witnessed by the proud families of the veterans, as well as hundreds of academy cadets and serving soldiers. The ambassador added that the congressional gold medal was the highest expression of national appreciation that could be bestowed by the US Congress. The shared experience of fighting the Japanese during World War Two and defeating a post-war communist rebellion had cemented the “special relationship” between the two countries, Kim said. Corporal Cato Pulac, who turned 100 years old in March, was one of the recipients of the congressional gold medal today. Picture by Pamela Mariz Geminiano. Santiago Busa Jr, a Filipino-American graduate from West Point and a PMA professor of Internal Relations, said it was important to remember how the two countries had fought side by side. 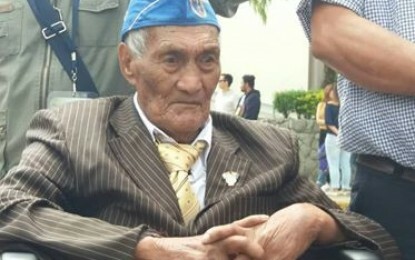 “Americans and Filipinos shall be taught about the sacrifice of both nations, which the medal symbolises that is proof of the involvement of the Filipinos in World War Two,” he said. Busa was part of a lobby group that went to Washington to urge the passage of Public Act 114-265, entitled “Filipino Veterans of World War II Congressional Gold Medal Act 0f 2016”.